BPE Fitting Valves - CSE. Chiang Sung Enterprise Co. The BPE fitting valves - BPE ferrule provided by Chiang Sung. The materials are offered for Biochemical, pharmaceutical, chemical and in case of food machine equipment. The chemcial position of Sulphur is between 0.005 ~ 0.017 according to BPE standard ASME BPE-2002. BPE fitting grade: SF1, SF2, SF3, SF4, SF5, SF6. The serious of BPE products that CSE offers are machined by solid bar or forged. Service Tee, Elbwo, Reducer, Cross as the part number DT-7, DT-8, DT-9, DT-10, DT-11, DT-12, DT-13, DT-14, DT-15, DT-16, DT-17, DT-18, DT-19, DT-20, DT-21, DT-22, DT-25, DT-27, DT-28, DT-29. 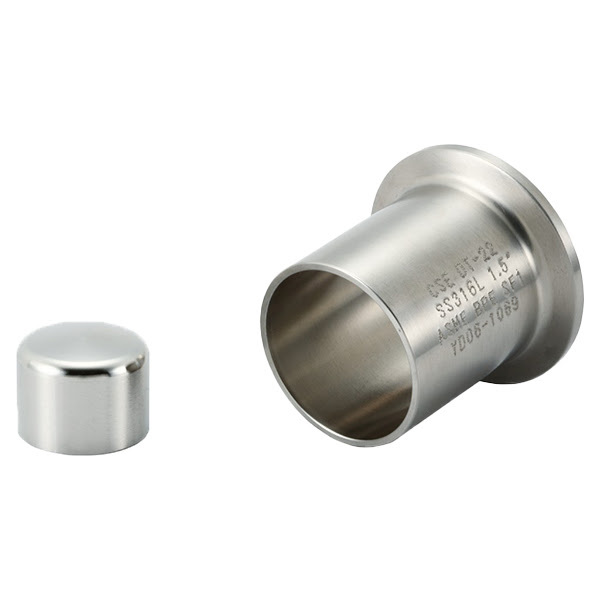 The serious of BPE products could be conformed with 3A-16AMP Blank End Cap which is made by solid bar, 3A-Clamp and Seal 13PG, 13FG as well as other Adapters. 1/2", 3/4", 1", 1.5", 2", 2.5", 3" ,4"